Set up in 2004, the Injuries Board is the self-funding Government body that awards compensation to personal injury claimants for accidents on the road, in the workplace and in public places. Claimants can deal directly with the Board and can submit a personal injury claim via the Board’s website, by post, or by telephoning their LoCall number. The Board’s personal injury assessors, who are highly trained and experienced, work with all claimants to ensure their claim is assessed in accordance with the injuries sustained and within a statutory timeframe (usually within 9 months). Given that Ireland is adopting mobile technology at a rapid pace, with over 1.5 million people now using a smartphone, the Board felt that it was important to extend its public service to mobile users through an always-on app for Android and iPhone. The Injuries Board developed this new app to meet this 24/7 demand, giving consumers on-the-go access to information about the Board, its activities, and the claims process, in the palm of their hand. The personal injuries app allows users to gather key facts about the Injuries Board process. It is part of the Board’s public information and education campaign and complements its recently revamped website and online claims service. Murray Consultants, who provide communications advice to the Injuries Board, commissioned Púca to develop a native android and iPhone personal injuries app that would provide consumers with on-the-go access to the information and tools they need to familiarise themselves with the services provided by the Injuries Board. 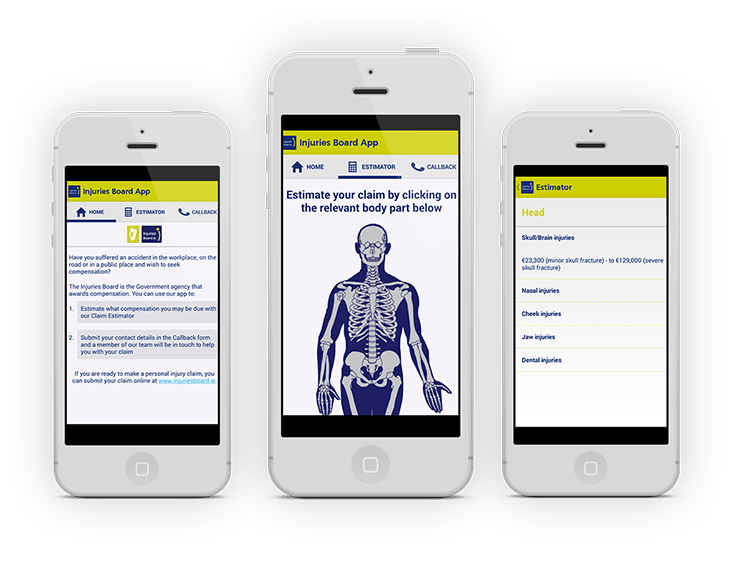 As the official state body responsible for handling personal injury claims and awarding compensation to accident victims, the Board felt it was important to extend their existing information Platforms into the mobile channel – to offer consumers another reliable information resource on how to make a personal injury claim. To ensure the Board delivers a user friendly and efficient direct service to consumers, claimants can submit a personal injury claim to the Board online via its website 24/7, by post, or through its call centre that operates from 8am to 8pm, Monday to Friday. Púca met with Murray Consultants and the Injuries Board to take a detailed brief of the requirements and the desired app functionality. Collaborating with the Injuries Board, Murray Consultants provided final content and detailed design requirements to Púca. Púca then translated the brief into a high specification app within a tight timeframe. Púca’s team focused on keeping the navigation as simple and intuitive as possible, with a particular emphasis on “universal design” guidelines, to ensure the app was as intuitive and accessible as possible to a wide variety of users of all abilities. The Injuries Board App was released in September 2013, and then launched to national and regional press and broadcast outlets, and to technology journalists and bloggers. On the occasion of the app launch, Injuries Board CEO Patricia Byron conducted a national interview with RTÉ’s Morning Ireland and four interviews with local radio. The app received press coverage in national media, and in a number of regional titles around the country.